Areas of precipitation that are forecast along your proposed route should get your attention. These should be considered “hot spots” for concern and may add undo risk to the flight. While precipitation isn’t always problematic, even to pilots flying under visual flight rules (VFR), adverse weather elements such as thunderstorms, low IFR conditions, mountain obscuration, reduced visibility, airframe icing and turbulence tend to occur in and around areas of precipitation. So these precipitation areas are regions that pilots need to drill down a little deeper to determine what, if any, impact they may create on their planned flight. This is the reason we introduced the 6 hour Quantitative Precipitation Forecast, or QPF, in ForeFlight Mobile 7.1. Shown below, the QPF represents excellent guidance when planning a cross country trip, whether your flight is several hours or several days in the future. You can find the 6 hour QPF under the CONUS Weather in the USA Ensembles. 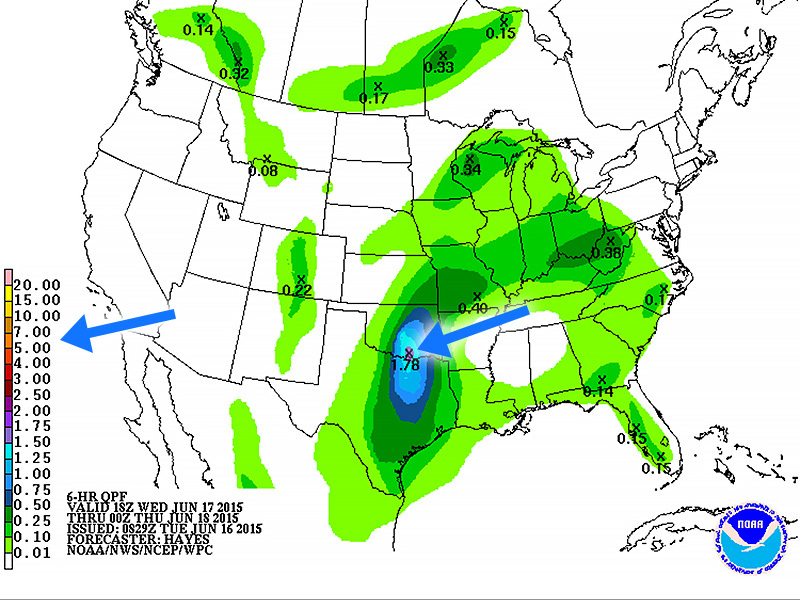 So let’s take a look at the advantages and limitations of the QPF. This is the 6 hour QPF or Quantitative Precipitation Forecast. Most pilots are familiar with the precipitation forecast on Prog charts. Precipitation identified on prog charts such as the one shown below is considered an instantaneous precipitation forecast. That is, the precipitation shown is valid at a single time and represents precipitation coverage or where precipitation is expected to be reaching the surface at the valid time. The Prog chart includes an instantaneous precipitation forecast valid at a single time as shown in the lower left. Instead of a single time, the QPF is valid over a range of time. In other words, it is the quantity of precipitation expressed in inches that is expected to reach the surface over a specific period of time. In this case, the period is six hours so the forecast is called a 6 hour QPF. The valid range of time is shown in the date-time stamp on the lower left, so this forecast is valid from 0600 through 1200 UTC as shown below. It is important to note that unlike Prog charts, the QPF does not distinguish between the type of precipitation (rain, snow, freezing rain, etc.) nor does it tell you if the precipitation is the result of deep, moist convection or thunderstorms. Solid-filled color contours are drawn based on the expected precipitation amount (in inches) within the six hour forecast period using the scale in the lower left. Any “X” on the chart tells you the local maXimum precipitation amount (also in inches) within it’s respective contoured area. So for this forecast below in eastern Oklahoma and Texas, a maximum of 1.78” of precipitation is anticipated to reach the surface between the period beginning at 1800 UTC through 0000 UTC. In the case of wintry precipitation such as snow or ice pellets, the forecast roughly approximates the melted equivalent. Typically 12 inches of snow melted down represents about 1 inch of rain. Also, the QPF doesn’t specify when the precipitation is expected within the valid range of time; it could fall all in the first hour, all in the last hour or it could be a continuous light rain falling throughout the entire forecast period. This is especially important to understand when the precipitation may be from convection. Often during the warm season, most of the precipitation forecast may fall within an hour or two and that could be near the beginning or end of the forecast period leaving much of the valid time free of precipitation. The QPF offers a couple of distinct advantages over the instantaneous precipitation forecasts found on the Prog charts. Given that precipitation forecasts on prog charts represent coverage and are valid at a single time, the QPF can highlight areas of precipitation that may occur between Prog chart forecasts. For example, it is possible that an area of showers and thunderstorms may be expected to develop at 1900 UTC and dissipate by 2300 UTC. This area of precipitation would not be shown on the prog charts valid at 1800 and 0000 UTC, however, it would show up on the QPF. So the QPF is a complementary forecast to help fill in the gap in between prog chart forecasts. Another advantage is that Instantaneous precipitation shown on prog charts stops after 48 hours. However, given that the QPF is valid over a range of time which is considerably less difficult to forecast, they provide guidance out to 3.5 days in the future – perfect for those Friday to Sunday round-robin flights.